We at Swiss Family Treks and Expedition bid on serving our clients’ every need providing the best quality service. We deliver our clients with a-one transportation and accommodation facilities along with special tour packages and restricted area permits. Our locals guided by years of experience help you immerse completely in your journey. We make sure our clients have the best time during their stay in Nepal. Welcome to the beautiful country of Nepal. We will meet you at the airport and will transfer you to the hotel. You can stroll around the nearby marketplace if you wish to. Overnight at a 3-star hotel in Kathmandu. After breakfast, the day will begin as we move to the cultural world heritage sites in Kathmandu valley. The day comprises of the visits to the pilgrimage site of Hindus--Pashupatinath temple, one of the world’s largest stupa--Boudhanath, the Monkey Temple—Swayambhunath, and the ancient palace of Kathmandu Durbar Square with its many temples and distinctive buildings. In the evening, pre-trip discussion with our fellow trekking staff will be done. Overnight at the hotel. Start early by moving to the domestic airport and catching the first flight to Nepalgunj. Upon arrival in Nepalgunj, the change in topography is felt. 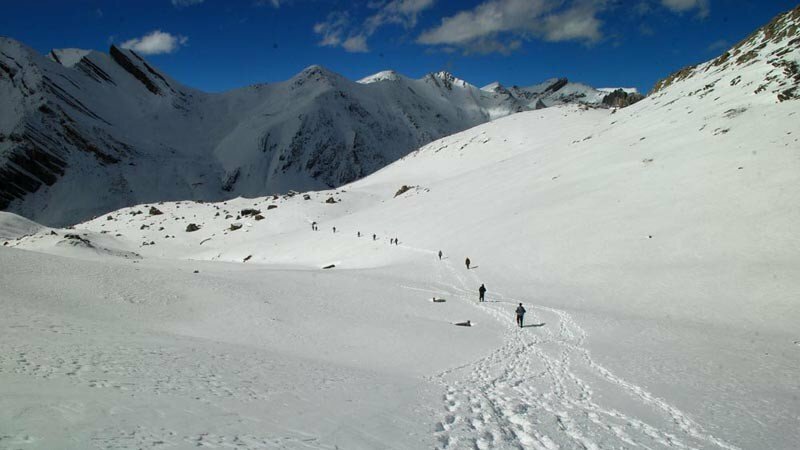 You will meet other team members who will guide you through the basic procedure of the trekking. Safety measures and precautions will be given. Overnight in Nepalgunj. We take a 35 minutes flight to Juphal, the only airstrip in Dolpo. The flight provides us with amazing landscapes, from the flatlands to the towering hills to the barren landscape of Dolpo. We will have plenty of time in Juphal, so feel free to explore the small town and interact with the locals. Overnight in Juphal. Starting the trek, we go downhill to reach Thuli Bheri River and follow the trails of the river past several small villages to reach the confluence of Thuli Bheri River and Suli Gad. We then make a quick ascend through the forest of big cedar to reach Sulighat. Overnight in Sulighat. Leaving Sulighat, a big suspension bridge will take us to the entrance of Shey Phoksundo National Park (SPNP). 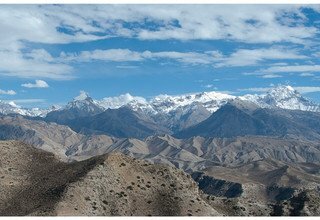 We then follow the trails of Suli Gad enjoying the distant views of Dhaulagiri Range. Then we will hike through the trail enclosed by pine, cypress, and bamboo forests until we reach Chhepka. Overnight in Chhepka. Today the trail takes us further to cross Sulligad Bridge from where we follow Phoksundo Khola upstream on a narrow path high up in the valley. We move through forests with several bamboos stands further up the gorge. The gorge extends out as we pass a river union and continue on the trail alongside Phoksundo Khola to cross a bridge that takes us to Amchi Hospital. Overnight in Amchi. The trail descends through birch forests leading to the upper part of the Phoksundo Khola. 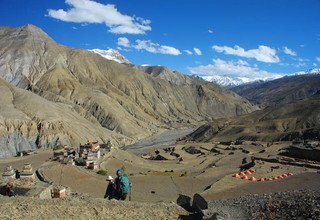 Then we ascend to Ringmo village, an attractive settlement with flat-roofed stone houses and lots of mud-plastered chortens and Mani walls. Just below Ringmo, we pass a bridge and move to the ranger station ahead of Phoksundo Lake (3730). We walk to the shores of the lake near the point where the Phoksundo Khola flows out. We move along the trail to finally reach Ringmo Gaon. Overnight in Ringmo. 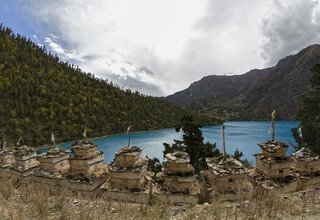 The village of Ringmo sits on the bank of Shey Phoksundo Lake, so today we spend our time exploring the tranquil lake. 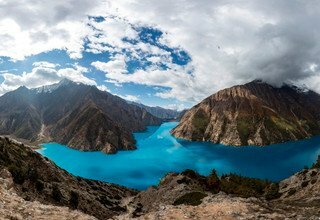 Also known as the deepest lake in Nepal, Phoksundo Lake is surrounded by sparsely vegetated hills that add to the allure of the already enchanting lake. The beautiful peak of Kanjirowa Himal (6612m) peeks behind the hills surrounding the lake. 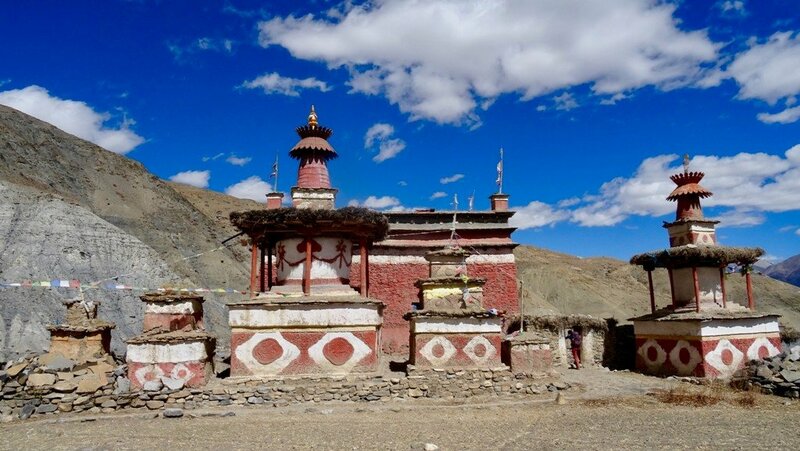 Later, we can explore Ringmo village made up of about 20 Tibetan styled houses built in a close knit fashion to form the village bounded by dispersed cairns and Chortens. Overnight in Ringmo. We hike back up to the lake and walk along its bank all the way to its bottom. We then follow the trail through the riverbed of Phoksundo Khola relishing the view of Kanjirowa Himal (6612m). Then we move to reach the campsite in Chabluk Phu, a grazing area, just where the trail hits leveled ground. Overnight in Chabluk Phu. From Chabluk Phu, we continue up the gorge with irregular juniper and azalea tree line before crossing a bridge over the river. We then make a steep climb on a cliff above Tuk Kyaksa Khola to reach Nagdolo La Base Camp, also known as Snowfields Camp, which is situated next to the river. 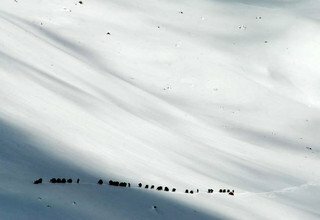 This Camp was entitled by Peter Mathiesson in his book “Snow Leopard”. 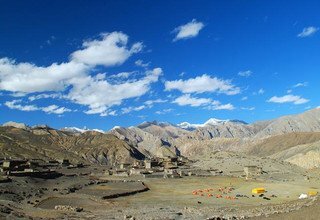 Snowfields Camp is at the base of Kang La also known as Nagdalo La (5350m) that leads to Upper Dolpo. This is also a useful acclimatization walk that will surely help with tomorrow’s hike. Overnight in the base camp. 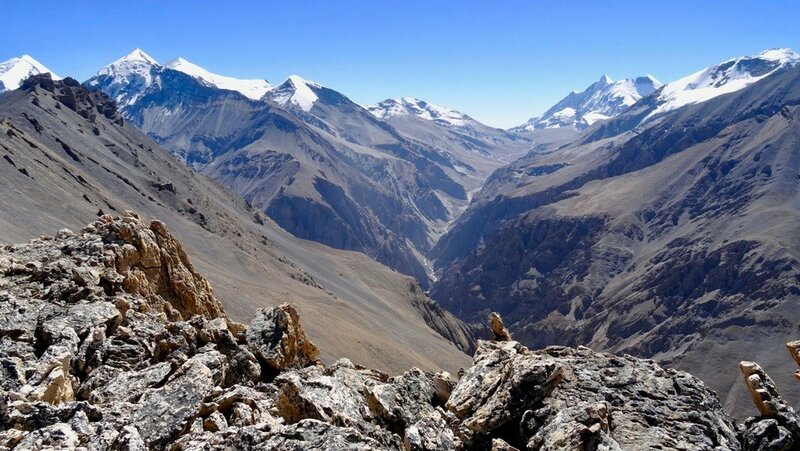 We make a long and energetic ascent for about 2 and half hours over a dusty path to reach Ngadalo La (5350m). 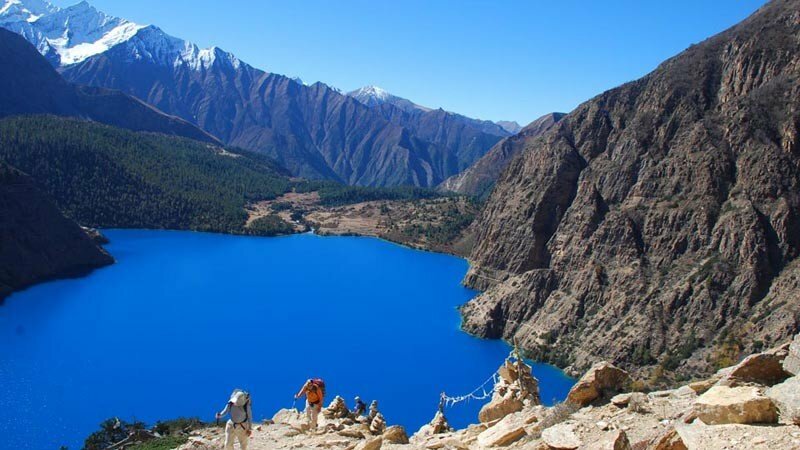 An amazing view of Phoksundo Lake and the Upper Dolpo region can be seen from the top of the pass including the view of the Kanjirowa Himal range. Then we descend on a path covered with snow to reach Shey Gompa, a very small village with a couple of houses and the Gompa. It is an 11th century gompa, located below the Crystal Mountain on a small grassy plain at the union of Sephu Khola and Hubaiun Khola. Overnight in Shey Gompa. 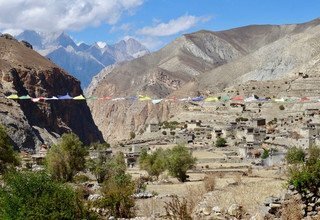 We rest today and explore the area around Shey Gompa. Shey Gompa was built in 1655 and the monastery is renowned for its giant copper with the gold-plated gold statue of a seated Sakyamuni Buddha. To the east of the Gompa is Crystal Mountain which is a unique mountain as its twisted cliffs are mixed with quartz and embedded with a rich variety of aquatic fossils. We spend the day climbing around Shey village where you can get the glimpse of its pre-Buddhist culture, the Bon Po. Overnight in Shey Gompa. To get to Namgung, we leave Shey Gompa and make a steep climb to Sela La (5094m). 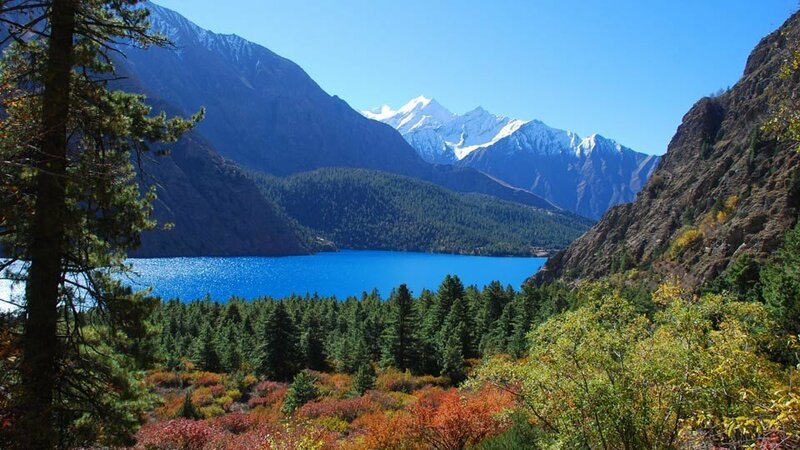 While we are descending through Sela La Pass (5094m), we can enjoy the beautiful sight of the northern part of the Tibetan plateau, which is the highest highland in the world. We go downhill to the meadows of Namgung and visit Namgung Monastery before moving into the village. Overnight in Namung. Our trek to Saldang starts with ascending slope lines with a few trees. We have to climb for a while before going downhill to the attractive village of Saldang, situated on a highland above Namha Khola. 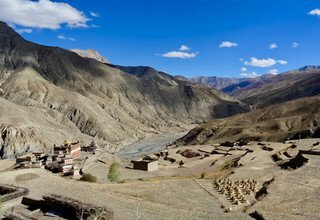 Contrary to the popular belief, the village is wealthy, not only agriculturally but also for its planned locality on a trade route to Tibet. 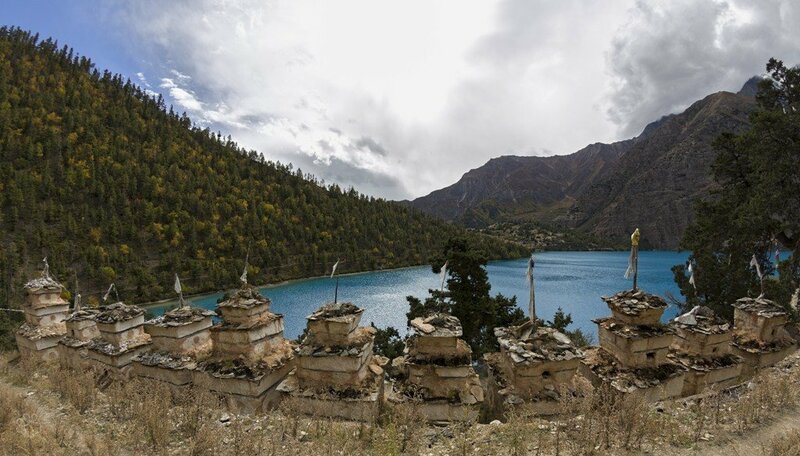 The village also used to be a separate kingdom of Dolpo in the ancient times. Overnight in Saldang. Today we take another rest day so that we can explore the beautiful Saldang village. The arid yet picturesque village, encompassed by sand dunes, is home to centuries old monasteries like Samye Choling Monastery and Jovo Monastery along with their many Mani walls and prayer flags. 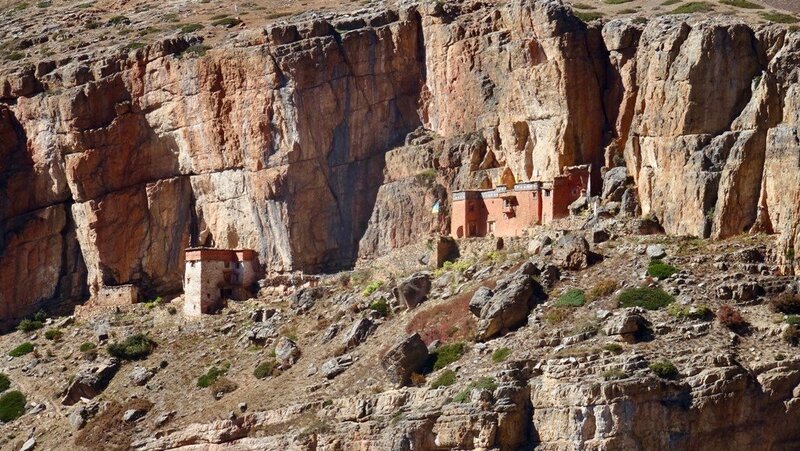 Apart from the monasteries, we will also visit the hidden hamlets around Saldang. Overnight in Saldang. From Saldang, we move further along the quite paths leading to Khomasgaon. The track goes along the vast landscape composed of sand dunes and bare hills, moving through several white-washed villages, long Mani walls, and painted chortens. We cross small streams and climb uphill and downhill until we reach Khomagaon. Overnight in Khomagaon. After breakfast, we leave our campsite at Khomasgaon and start moving further following the trail that goes through traditional villages and Mani walls. 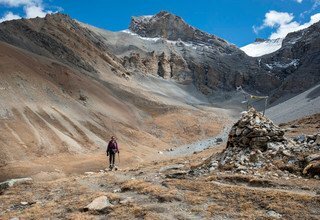 We cross Nang La Pass (4375m) and climb down along the arid terrain to reach Panjyan Khola on whose bank Mendo is situated. We walk alongside the river for a while to reach Mendo via Shimen Gompa. Overnight in Mendo. Today our trek continues as we move downhill along the off-road trails above the gorge of Panjyan Khola. 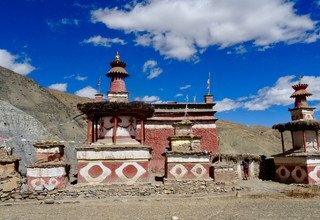 We visit the ancient Pu Gompa before continuing on our trail to Tinkyu. 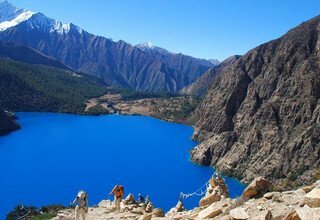 The sights of spectacular sceneries and the exclusive culture of Upper Dolpo surely put forward enchanted experiences to the trekkers. After a long and good trek day, we reach Tinkyu. Overnight in Tinkyu. This is the main village in an extensive valley with wide fields, two Gompas, and an old fortress. The famous Dolpo-pa artist Tenzing Norbu Lama was born in this village and had trained in the art of traditional Tibetan thanka painting. He helped to train villagers from Tinkyu to paint and yield handcraft leather goods. 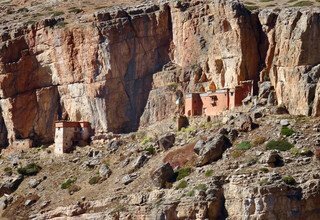 We explore the village thoroughly and also visit the many ancient monasteries situated around Tinjye before calling it a day. Overnight in Tikyu. We move alongside Panjyan Khola to an old settlement and arrive at a river union where we take the left tributary Kehein Khola to move across the left bank of the river. We cross several bridges above Kehein Khola to reach Rapka where we camp for the night. After breakfast, we move from Rapka and hike over the track that goes uphill mildly towards Chharka La Pass (5027m). After arriving at the top of the pass, we go downhill on the side of the gorge and descend to Chharka Village located at the bank of Chharka Tulsi Khola. 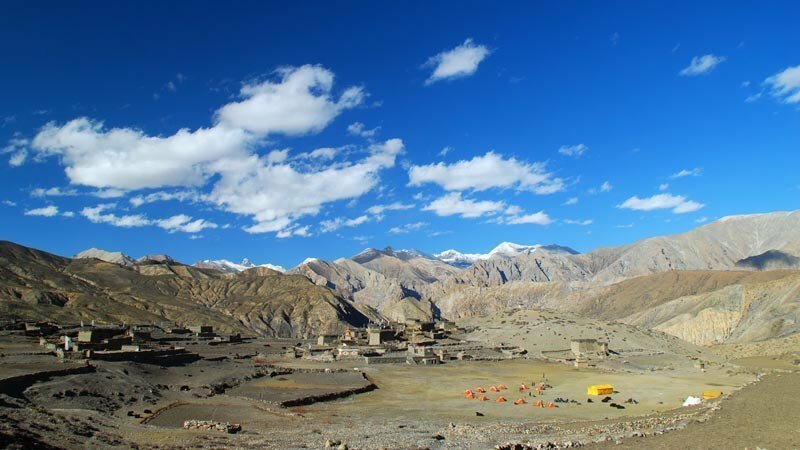 In the evening, we will visit Sarchhen Gompa situated in the center of the scattered village. Overnight in Chharka Bhot. Today we can either explore the village or just relax before confronting the exciting days ahead. 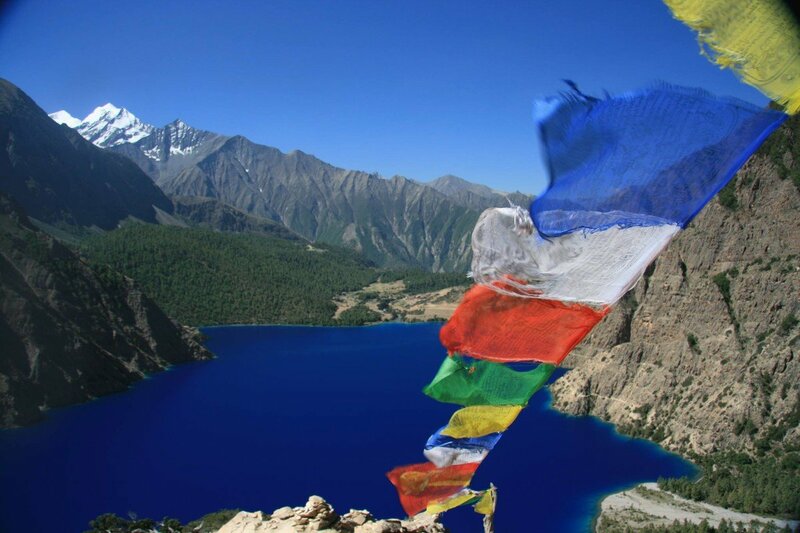 We will explore the two gompas, Buddhist and Bönpo, signifying the two religions of Dolpo. This day could also be used as a buffer in case of any postponements. Overnight in Chharka Bhot. Today we move downhill to the stream, and then we continue to trek next to the right bank while ascending on an uneven trail. We move into a big meadow as the valley contracts. Our trek continues as we ascend to reach our campsite in Norbulung. Various peaks of the Dhaulagiri massif start to come in sight as we near the Annapurna region. Overnight in Norbulung. We start to follow the trail alongside a small stream that ascends to Molum Sumdo, a yak pasture. Our trek ascends slowly before making a long traverse across fields to reach the base of Sangda La (5120m). From Molum Sumdo, we can get a good view of Dhaulagiri II (7751m), Tongu Himal (6197m), and several other snow-capped peaks. Overnight in Molum Sumdo. After breakfast, we ascend to the pass of Sangda La (5120m) before moving down to the village of Sangda Phedi. 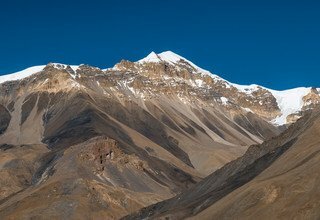 The top of the pass allows us to get an ood view of the Dhaulagiri massif along with the surrounding landscape. From there, we move downhill to reach the compressed settlement of Sangda. Overnight in Sangda Phedi. 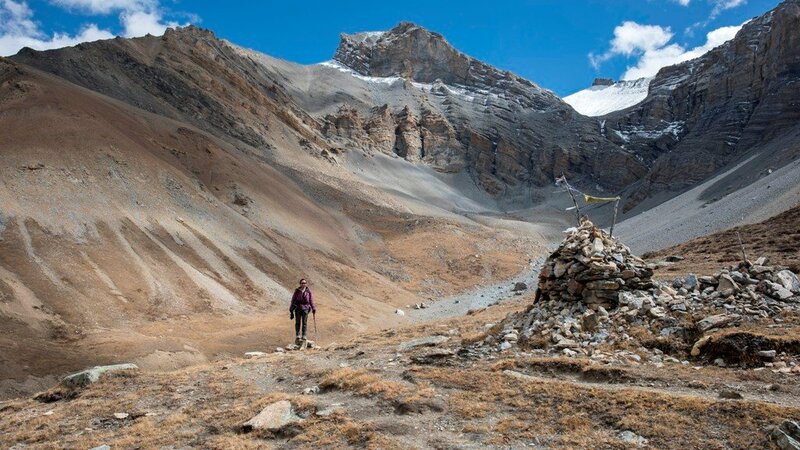 Leaving Dolpo behind, we make our way through Annapurna Conservation Area and make a quick ascend to Jugben La (5550m). Later, we move downhill through a steep gorge to pass the first tributary river, and then we navigate to the second river passing on rocks. Soon after, we will see the entry chorten to Santa village followed by a big wall around the farmlands. Overnight in Santa. 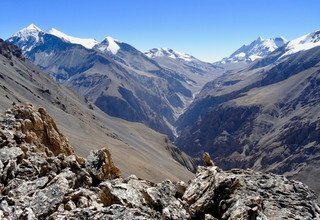 From Santa, we start ascending until reach Bhima Lojun La (4460m), from where we have a superb vista of the Kali Gandaki River valley. Observing snow-capped peaks, we descend through Mustang's patchy. Diverging from the main trail, we make a steep descend through the forest to reach Phalyak. Phalyak is an exciting Mustangi village which holds a yearly archery fiesta as most of the Mustangi and Managi villages do. Overnight in Phalyak. Today we follow a small tributary to reach Kali Gandaki River in Ekle Bhatti. We then walk on a flat trail through the riverbed to reach the windy town of Jomsom. After exploring the town, we will celebrate the accomplishment of the trip together. Later on, you can hand out tips to the staff for all their hard work throughout the trek. Overnight in Jomsom. Today we take two consecutive flights from Jomsom to Pokhara and Pokhara to Kathmandu. 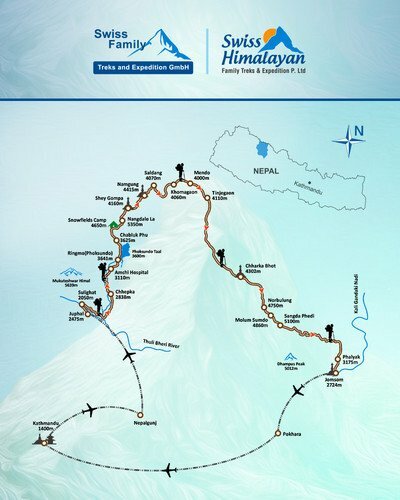 These flights will provide us with different landscapes that are typical to Nepal. The rows of hills and the vast network of rivers dominate the Nepalese terrain. Upon arrival in Kathmandu, you will be transferred to your hotel so that you can get a good rest. Overnight at 3-star hotel in Kathmandu. Day 31: Buffer Day in case of flight delayed and canceled and Stay overnight in Hotel. This day is kept as a contingency day. In case, we were unable to board either of the flights the day before, we can do it on this day. But if we had arrived in Kathmandu as planned, you can use this day to explore the various markets and temples of Kathmandu. Overnight in Kathmandu. Today you will head back to your home country. After breakfast, our representative will leave you at the airport 3 hours before the scheduled time of your flight. NOTE: Our trekking itinerary and campsites may vary slightly depending on local trail conditions, the group's acclimatization rate and the Western, Sherpa or Tibetan guide's discretion. 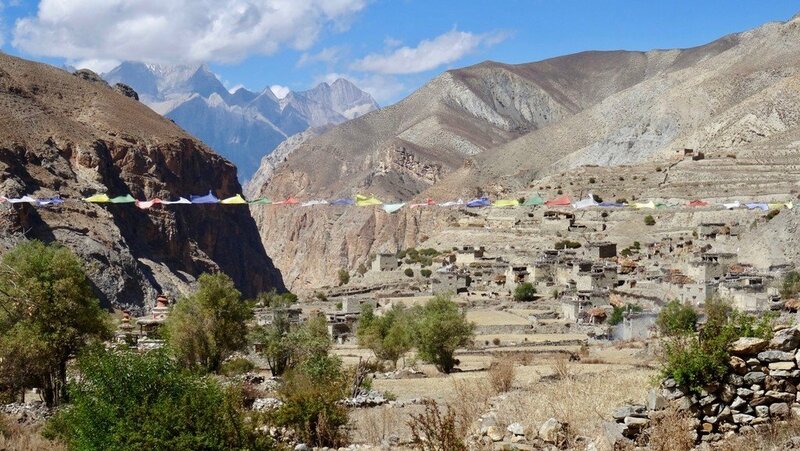 We strongly suggest scheduling an extra day in Kathmandu at the end of the trek that allow for possible flight delays in getting to Juphal and/or out of Jomsom. First of all we like to pay you a big compliment: because of external circumstances we had to completely change our program while on the trek already — and you still made everything work out perfectly. 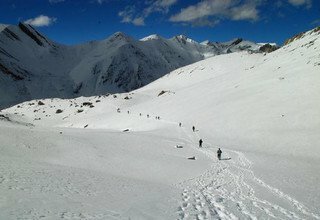 We started our originally planned trek to Upper Dolpo and Jomson well enough, but encountered too much snow in the higher regions. Because it would have been too dangerous to cross the high passes under these conditions, our guide advised us to turn back and pursue a different option. Thus we ended up trekking form Juphal to Rara Lake — a trek which we would not have chosen in the first place but which proved to be far more impressive than we expected. The scenery was amazing and trekking through cultural land gave us very interesting insights into the rural life in Western Nepal. 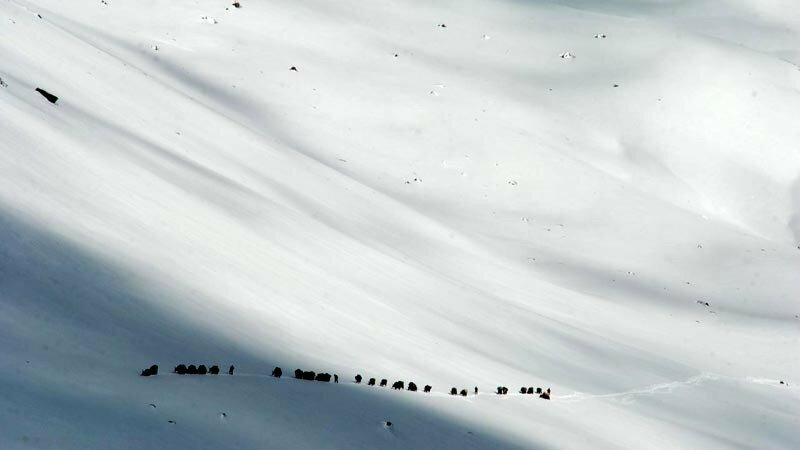 Above all, the trek was really of the beaten tracks — we did not encounter any other tourists for more than two weeks. 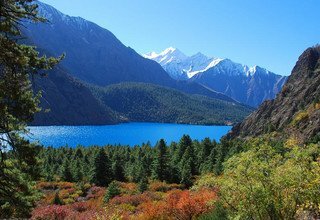 Having been prepared for a different trek, our guide and crew had to improvise — but they came up with a good program and they managed to find great picnic areas and camping sites. Our crew was just wonderful: friendly, helpful, funny, hardworking and always smiling. A big compliment also to the back office in Kathmandu: because we ended our trek in Jumla instead of Jomson, they had to rebook our domestic flights and organize alternative modes of transportation for our crew. Everything worked out perfectly and we reached Kathmandu on time. Thus, dear Stephan, and team, we want to thank you all for an unforgettable trek. This is the second time we used the services of your company and we can only recommend you.